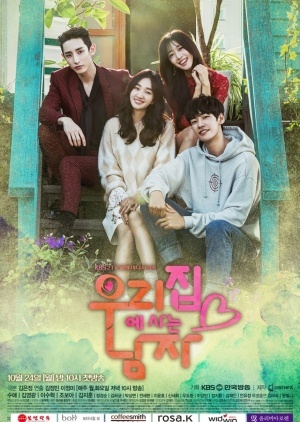 This drama is based on the 2015 webtoon “우리집에 사는 남자 / The Man Living in Our House” by “유현숙 / Yoo Hyun Sook” which was published from 2015-March-24 to 2016-May-24 via Daum. This story tells the cohabitation romance between a flight attendant returning to her deceased mother’s house and the husband of her dead mom. Hong Na Ri (Soo Ae) works as a flight attendant. Her mother passed away 3 years ago and she doesn’t have any other immediate family members. She then returns to her hometown to visit her mother’s grave during her death anniversary. There, she sees a young man, Go Nan Gil (Kim Young Kwang) at her mother’s grave. He introduces himself as her father. Before Hong Na Ri’s mother died, she married Go Nan Gil. He now lives at her mother’s house and runs the small dumpling restaurant that her mother ran. She doesn’t believe him and then sets out on a mission to prove he is lying.